And I am loving it as this makes it the perfect opportunity to wear my Cheap Monday seamed jumper. This has been waiting patiently in my wardrobe for some time - and now the time has finally come. Jumper: Cheap Monday - Link! 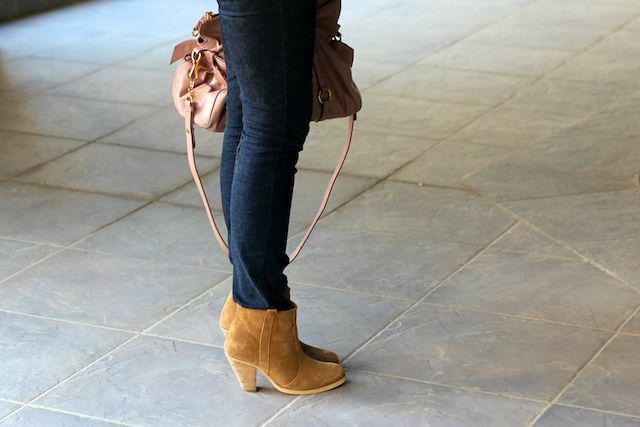 Boots: ASOS Aggie boots - Link! I also wore my new lipstick today - a new little YSL number. I think this has been out for some time and everytime I have meandered past the counters I have mentally clocked it. 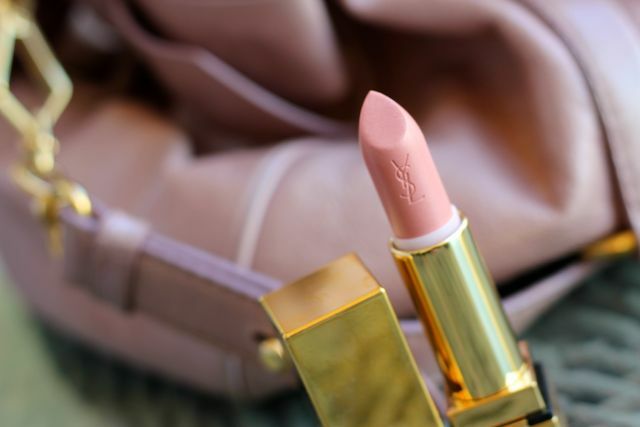 Meet YSL Rouge Pur Couture in 37. How could I end this post without saying - have a fantastic Christmas! I have the whole day off! Woo! Yes, Christmas is more of a commercial, rather than official event in Dubai. That means offices are open as usual but shopping malls are decked out with lights, trees, and Santas. MERRY MERRY CHRISTMAS LAURA!!! WISH YOU ALL THE BEST! Lovely!! Group hug for sure! Merry Christmas, Laura, I thought of you this morning and I could not wait to enter and wish you a wonderful night. You look gorgeous as usual! Could you do a post on how you get your hair to look so amazing? ( products and tools) ..
And a Happy (hot) Christmas to you too Laura! tres chic :) The lipstick looks beaut on you too! Oo that jumper is nice- it makes me longer for warmer weather in the UK! That is a lovely lipstick too, although I think I am slightly too pale for it. Have a wonderful holiday! Keep warm! You look fabulous! You always look so effortlessly chic :) merry christmas! I love the jumper and the shoes they look great, the colour of the jumper is stunning. Also the lipstick and the colour of the bag look great together! Love the jumper and that pink lipstick is so pretty on you! Happy holidays!! Lovely jumper, I actually just bought one from Stefanel when they had a 20% discount. Chunky knit with a buttoned back and leather inserts. I love chunky knits! Have a lovely Christmas and thank you for the enabling and entertaining posts all year! Wow I love it! I sort of looks like a purposely done cross, which I adorreeee!. I went travelling this year in the lead up to Christmas to countries where Christmas isn't such a big event. It was kinda nice coming back to Australia having missed out on all the madness in the lead up. Your hair looks great here. Its getting really long again yay! I really like the Jumper Laura,you look really nice and cozy. Have a lovely day off and merry Christmas at that. Thank you for all your lovely blog posts. love the jumper!! and that lippie is absolutely gorge!! Merry christmas guys!! Laura, this look is so effortless! I love it! Your make up is so soft and beautiful! What nail polish are you wearing? Love love love! Laura I don't want to be offensive but...are you a little bit too orange??? fake tan? blush? foundation? camera? I have a jumper similar to that one, you're right, they're just so damn cosy!! The lip color is lovely, my favorite generic pink is MAC's Angel. It's so perfectly pink. the jumper looks great on you! Very cute outfit! you look very comfortable ! I was going to get this sweater on shop bop, but thought about it too long and it sold out. Such a cute outfit. I love a chunky oversized knit over a pair of form-fitting bottoms! I wish I was in Dubai!!! Great buys! Love this... so simple and fresh.